Save time and focus on what you would like to see the most. This private SUV tour is driven and narrated by a Bay Area born owner-operator with a decade of professional tour experience. Unlike many other tours, clear English is spoken. Your day will be a perfect mix of natural wonders and urban exploration. See the sights of San Francisco before and after a journey over the Golden Gate Bridge to Muir Woods & and the charming town of Sausalito. Our advantage is that bus & van tours are limited as to where they can drive in San Francisco. This comfortable, large SUV can access areas and neighborhoods where larger tours are prohibited. Don't miss out on the Crooked Lombard Street, Coit Tower, Painted Ladies of Alamo Square, Marina Green or the expensive Sea Cliff neighborhood. Transportation is provided in an extended 2015 Ford Expedition EL XLT equipped with 4-wheel drive. This vehicle was selected for its size and 3rd row space which has 17% more leg room than other SUVs of its model year. There is trunk space that can fit your bags, a wheelchair or stroller. Coach buses over 35 ft are not advised on the steep, narrow and winding road down to Muir Woods. You may request that your driver takes it slow if you are sensitive to the curves and hills near Mount Tamalpais. Your private SUV drops you off close to the forest entrance. Only rangers can guide inside Muir Woods so your driver will give you instructions before you set off to explore on your own. It takes about 45 minutes round trip to Cathedral Grove where you find the oldest trees in this grove. If you want to take a longer walk, the Hillside Trail may be open depending on conditions (60-75 minutes). Not included: $10 admission into Muir Woods (per person 16 years and older). This fee is not included to prevent overcharging of smaller groups under 7 people, National Park annual pass holders and families with children. This way you only pay for the entrance fees you need and some company/driver does not pocket your extra tickets. After the woods you get free time in Sausalito to walk along the water, shop, dine or sip some wine before continuing the city tour in SF. See both the popular sights and places travelers sometimes miss. Learn about the neighborhoods from a local's perspective. Have your camera ready to capture the sweeping views, classic Victorian architecture and quirkiness that causes some to leave their heart in San Francisco or wear flowers in their hair. 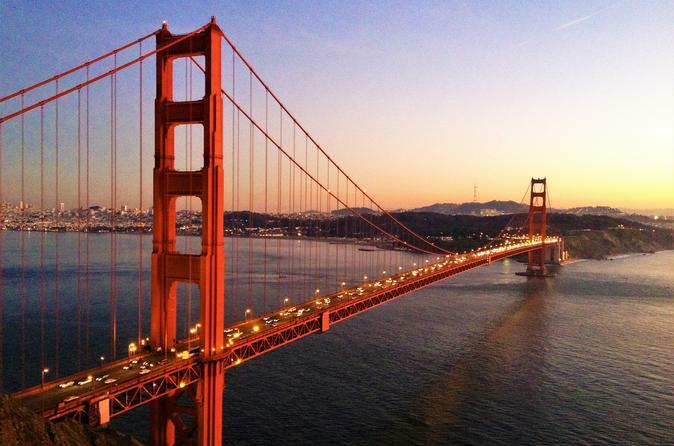 With up to 8 hours available between SF, Sausalito & Muir Woods, we can focus more on the areas that interest you most. Some of the places you may see while on tour are: China Town, Nob Hill, North Beach, Coit Tower, Pier 39, Fisherman's Wharf, Hyde St maritime ships, Ghirardelli Square, Lombard Street, Fort Mason, The Marina Green, Palace of Fine Arts, Billionaire's Row, The Presidio, Crissy Field, Fort Point, The Golden Gate Bridge, Baker Beach, Sea Cliff, Sutro Bath Ruins, The Cliff House, Ocean Beach, Golden Gate Park, Haight Ashbury, Twin Peaks (weather permitting) Alamo Square, The Castro, Civic Center & Union Square. Pickup is at your San Francisco hotel at 9am. There is an additional charge ($100 per hour) for tours starting or ending outside of SF. Your driver will optimize the schedule based on the traffic patterns for your chosen day of the week. Lunch is on your own and can take place when and where you choose. Your driver will have recommendations for each location. We normally finish up with seeing San Francisco's sights around 5pm or 8 hours after your desired start time. Send a message to choose a custom time.